Majority of the Indian population used to accept baldness as a natural phenomenon and live with it compromising on their dreams and outlook. Was even resulting in being misled by Quacks and botched up procedures. This was primarily due to lack of availability of those international standards and technology on which they could believe without a doubt in their mind. People used to save fund so as to accumulate enough for getting the same done from abroad, which for most Indians, until a few years ago, was just a tough dream. Studies and statistics have shown that in India, males are now facing baldness issues as early in their 20s now. This is undoubtedly an alarming sign! As the demand for more affordable hair transplant surgery continues to grow, it is not surprising to know that the Team of Doctors in India – Dr. Arika Bansal, Dr. Pradeep Sethi, Dr. Sarita Sanke and Dr. Abhinav Kumar, with their clinical expertise and world-recognized Technique for Hair Transplant – the DHT® technique, have now made it possible for patients within India and overseas to come and avail world-class treatment. With their International Standard Infrastructure coupled with strict protocols for Safety and Quality, they aim to create a Baldness-free India. Their DHT technique has brought a revolution in the concept of hair transplant across the globe. Now it is the most sought-after technique and is being appreciated by Top Surgeons worldwide. Encouraged with this feedback, they decided to only focus on HAIR RESTORATION SERVICES. With their clinical associations and accreditations from the biggest and the greatest authorities globally, they have been training other Doctors, at both national and international symposiums & workshops, on their Technique. In a very short span of time, Eugenix Hair Sciences has become the most preferred name amongst Hair Transplants in India. Their Mumbai centre is gaining popularity and you will see patients coming in from significant backgrounds and status, coming and availing treatments from the Hair Experts! 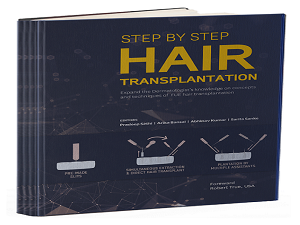 With an aim to disseminate their learnings and knowledge to other surgeons and the budding medical students, they have recently launched their book ” Step by Step Hair Transplantation“. And yes, it was keenly awaited amongst those associated with the Hair Transplant world. This book is written with noble intention to teach young and experienced dermatologist, the finer skills of FUE and DHT technique of hair transplantation. It has immense scientific illustrations with practical tips, for neophyte as well as veteran surgeons, that demonstrates, reinforces, and expands on clinical aspects. Besides the Doctor Duo (Dr. Pradeep Sethi and Dr. Arika Bansal), it also authored by Dr. Abhinav Kumar and Dr. Sarita Sanke. Is enriched by scientific references and recommendations provided by more than 10 international stalwarts in the field and represents the fastest growing segment in the hair-restoration field in terms of ethics, terminology, techniques, quality, and patient candidacy. All of the authors have entered the field of hair restoration surgery (HRS) within the past ten years and so what they present is truly a 21st-century view of the field. The book is comprehensive and begins with the all-important topics of patient evaluation, preoperative planning, and pre-, intra- and post-operative care. The authors outline underlying principles and practical tips in design elements for the hairline, temples, and crown. They have focused their surgical approach on Follicular Unit Excision (FUE) which has emerged as a dominant, if not preferred, technique of harvesting grafts for transplantation. They present a thorough discussion of details in the techniques required to excise high-quality grafts, to extract the grafts and handle them while out of the body and during placement to achieve optimal outcomes. So, Hair Worries shall now be all gone! As a bonus, the authors have added chapters on beard harvesting and transplantation, eyebrow transplantation, eyelash reconstruction, as well as the unique aspects of treating women with hair loss. In addition, they present a well-conceived and executed approach to the difficult cases of those requiring corrective surgery and to the causes, prevention, and management of surgical complications.